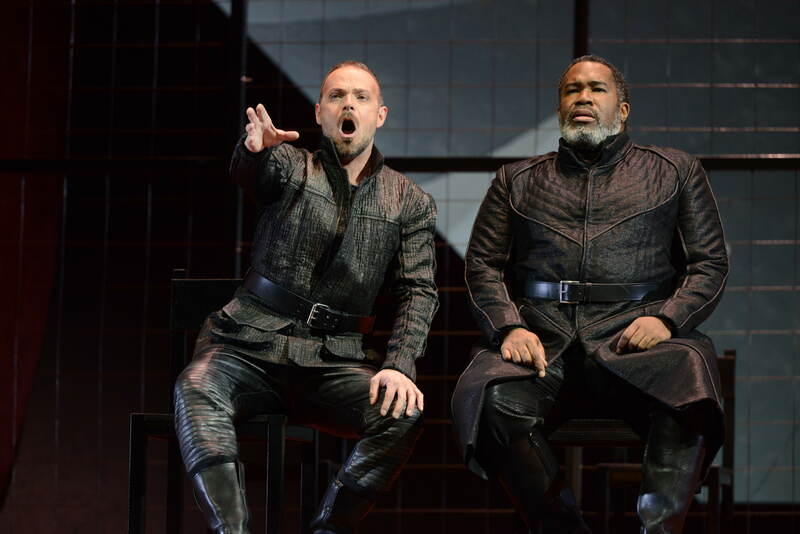 Watching the final, marvelous performance of Opera Philadelphia’s Don Carlo, I thought about the company’s extraordinary rise to a new standard, under General Director David Devan. This opera is among Verdi’s greatest – but also most difficult to stage and cast. To have do it as it was done here – with elegance and class, and with all five principal roles (six if you count the Grand Inquisitor) performed honorably or better – is a major achievement. I also pondered the particular power of Don Carlo, which, while certainly a grand opera – the original is precisely that, written in French, and in five acts – makes its great points in the most intimate way: through extended monologues (often with gorgeously mournful orchestral preludes), and two-person scenes. A hallmark of director Tim Alberry’s fine production is how much he treats these scenes as actual conversations. It’s rare in staged opera that singers consistently make eye contact with each other – they do here, and it’s powerful. Facial expression and body language are consistently engaged. Eric Owens (Philip II) has an almost cinematic presence, with a combination of grandeur and stillness that is riveting to watch. There is an interiority to his performance – his hushed opening to the great monologue “Ella giammai m’amo” for once sounded (as it’s mean to) as though it was more thought than sung. He also has a sumptuous voice that’s full of colors, and he consistently controls the dynamics in an interesting way. Watching Cook and Owens together, I realized how rare it is in opera that characters actually seem to be talking to one another. When they do – as here – it can be a revelation. The Rodrigo-Philip scene has never before grabbed my attention as it did here. The rest of the cast also distinguished themselves. Michelle DeYoung’s powerful mezzo isn’t ideal for Eboli – it doesn’t “speak” quite fast enough, and the range extremes test her – but it’s a lovely sound, and she’s a glamorous, alluring presence. Soprano Leah Crocetto was a good Elisabetta in the first two acts, and an exceptional one in the fourth act, where it really counts. Crocetto reminds me of Martina Arroyo – her tone has a similar youthful prettiness, but also amplitude in the upper range. Smaller roles were well taken – there’s always been a high company standard, in part because they make good use of Curtis and AVA students. Here, Jeremy Milner was a sonorous Monk, and Ashley Emerson a sparkling Tebaldo. Sarah Shafer made the most of her luminous solo as the celestial voice, and Mingjie Lei (Lerma and the Royal Herald) revealed an especially attractive, limpid tenor. 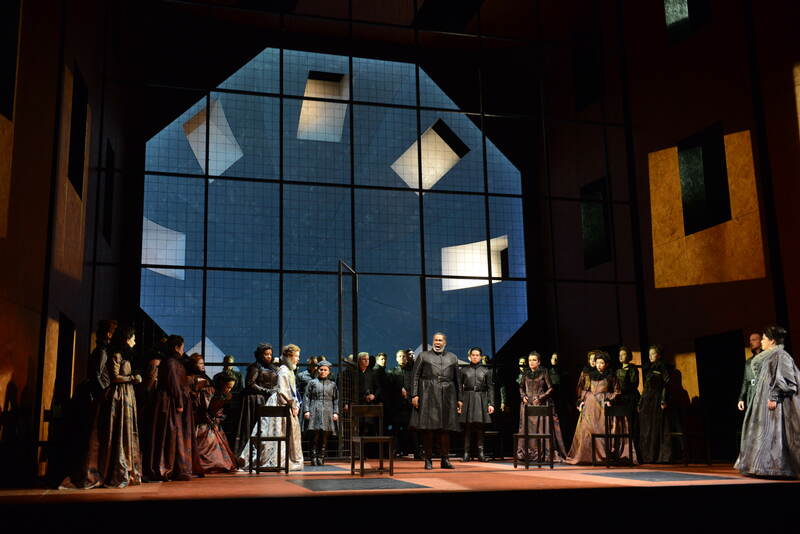 Of course, the musical foundation of this Don Carlo was the urgent conducting of Corrado Rovaris, who sculpted the score with care, and got consistently sonorous playing from the orchestra – also, well-knit choral singing in the ensembles. Finally, a word on the physical production. The size and specificity of the many settings in Don Carlo are nearly impossible to realize in production. Here, Alberry and his design team employ a unit set – an abstract vision of the Escorial dome. It has some limitations – a few scenes are meant to take place outdoors, briefly lifting a consistent feeling of claustrophobia, and here they didn’t really register. The Auto-da-fe needs more people and more sense of event. But for the most part, the production found a visual language that properly mirrored the piece. And hats off to Alberry for a brilliant bit of staging – using the prelude to Elisabetta’s Act IV aria to close out the scene before, where a cortege removes Rodrigo’s body. It was a haunting, magical moment in an afternoon notable for them. DF notes — I’ve just corrected a mistake in the first paragraph. 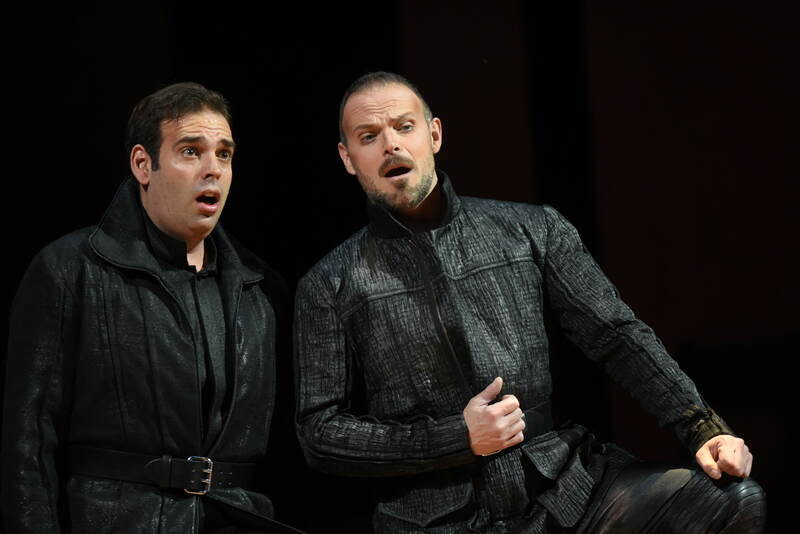 I had expressed doubt that a decade ago, the Philadelphia Opera would have done Don Carlo — but in fact, in 2004, when the company was under the directorship of Robert Driver, they did.